Customer base: Pocket folders, manual covers and collateral for health care providers and professional service vendors. Brandtjen & Kluge, LLC. 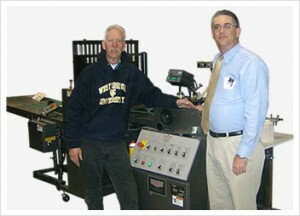 has manufactured and installed the 100th UniFold Automatic folder gluer at Jones Printing Services, Chesapeake, VA. Introduced in 1999, the Kluge UniFold folder gluer quickly found its place in the converting and finishing market. In addition to introducing the Kluge UniFold folder gluer in 1999, today the company manufactures and sells the OmniFold folder gluer as well as the BoxStar and Small Box folder gluer systems. Whether entering into the converting and finishing market or looking to expand your capabilities, Kluge manufactures the system you need. For a company so well known for its foil stamping, embossing and diecutting equipment, expanding their product line to include folding and gluing has been both a new venture and a challenge. “Such a large percentage of our customer base both finishes stock and then folds and glues it. Expanding into offering post-press equipment is a natural fit. The challenge has been to educate the customer base that we are more than just foil stamping, embossing and diecutting manufacturers,” says Hank. Rusty Williams, Bindery Foreman, Jones Printing Services likes his new UniFold Automatic folder gluer so much that he threatens to hurt anyone who tries to take it away from him! The Chesapeake, VA based print shop was established by Harry Jones (President) and his mother and father in 1976. Since then over 30 years later, the company has grown to 50 employees, including Harry’s three brothers and more recently, two nephews. Jones Printing Services configured their UniFold with a vacuum feeder, segmented table, converting station, Kluge patented vertical buckle fold unit, Final Fold II, 2-head hot melt glue system, and additional hot melt glue applicator. Their custom configuration gives them the most versatile machine setup for quick make-readies on the products that they manufacture, such as pocket folders, manual covers and collateral for health care providers and professional service vendors. “The Kluge UniFold automatic folder gluer is a solid machine. Our previous folder gluer (not manufactured by Kluge) only ‘just about’ did its job, and was reaching the end of its life. We wanted a fresh machine that would be easy to operate and help us expand further into the folding and gluing market. For us, the UniFold folder gluer seemed the only way to go, its modular construction makes the machine easy to configure for many different folding and gluing applications. Since its installation, the Kluge folder gluer has proved that our choice was the right one. With user-friendly features and speedy make-ready times, the machine has a very quick learning curve as well as multi-functionality, making it our ticket into the converting industry.